Computer Physicians in Longmont/Boulder Colorado provides affordable high end data recovery services at a lower cost on any storage device that contains the data. (computer, USB flash drive, internal or external hard drive, SD card, floppy, etc.) Bring your storage device to Computer Physicians in Longmont to examine and retrieve the data. loss due to multiple-drive failures is not uncommon. Data recovery is the retrieval of inaccessible or contaminated data from media that has been damaged in some way. With data storage devices such as hard drives, USB flash drives, etc. all becoming larger and capable of storing large gigabytes and terabytes of data. Data recovery is important since you could lose a lot of information at once. This kind of failure may occur due to different reasons, including failed ‘fdisk’operation or user errors that usually results in loss of information about partition location and size. Often power failure can cause loss of data from hard drives. Sudden power surges can also cause a lot of damage to a computer’s hard drive. Successful Data recovery depends on the actual cause of data loss and further user’s actions. To get maximum data recovery results it’s strongly recommended to stop any write access to the storage and bring the storage device to Computer Physicians in Longmont immediately. Any deleted file remains on the storage until the storage space is re-used by other data. After file deletion OS may re-use disk space anytime to store a new file. Thus, even minor write to the storage may cause permanent data loss. Internet browsers may be involved in overwriting of deleted files as well by saving cache or cookies to the storage. If you install the software to the same drive, your data is also under the risk of overwriting. Another factor that influences data recovery chances after file deletion is file deletion algorithm dependent on the file system. For Windows NTFS file system recovery chances are quite high, because if file descriptor remains on the disk, the software may easily take all required information about the file. Unlike NTFS, BSD UFS file system destroys information about file start, location and size permanently and together with high degree of file fragmentation typical of this file system leaves very slim chances for successful data recover. Other file systems (like FAT) feature average chances for data recovery. Here only part of information is destroyed (like information about file fragments), but information about file name, start and size still remains on disk. Heuristic algorithms still allow to ‘guess’ file fragments and recover good files. Please keep in mind, that due to lack of real information about allocation of file fragments any data recovery software may fail to detect real file position, especially if several fragmented files were deleted close to the same location on the storage. It’s not recommended to take any actions by yourself, since doing so may cause the data to be more difficult or impossible to retrieve. You will need to bring your storage device that contains the data (computer, USB flash drive, external hard drive, floppy, etc.) 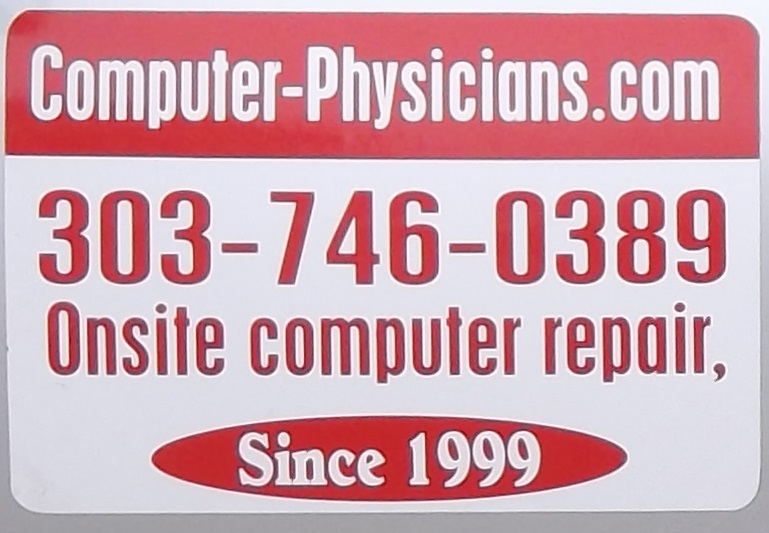 to Computer Physicians in Longmont or Boulder to examine and determine if the data can be retrieved.